Wataru Fujii and Yuichi Kazuki have been through many trials and tribulations, but when Yuichi goes to New York to visit Mizuho, an old girlfriend who is facing major surgery, Wataru begins to have doubts about the wisdom of letting him go. His worst fears seem to be realized when with only a limited explanation, Yuichi sends his ring back to wataru! What can the return of Yuichi’s precious ring – the symbol of his relationship with Wataru – possibly mean? In Tokyo, while Wataru worries and fumes, Yuichi’s older brother Shohei Kazuki continues scheming to end Wataru and Yuichi’s relationship. His reluctant ally in this endeavor is Masanobu Asaka – Yuichi’s senpai who confessed to Wataru! Will Shohei succeed in breaking up the two boys? Or will Wataru and Yuichi’s love each other prevail? 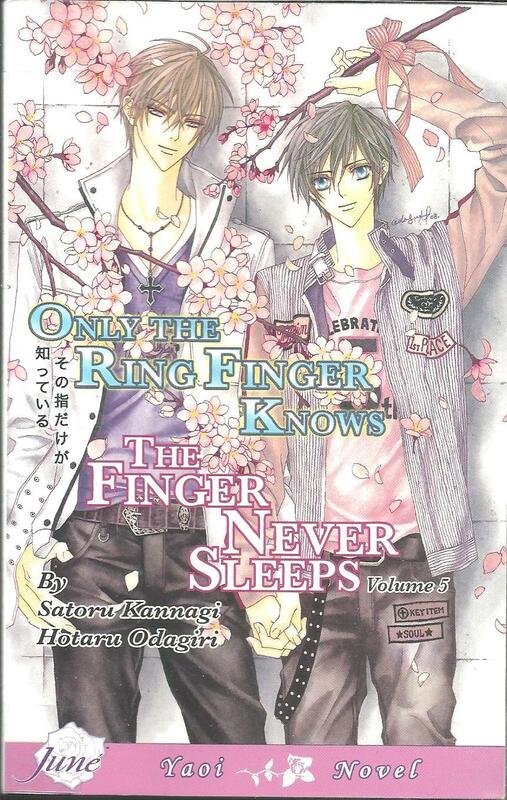 Don’t miss Only the Ring Finger Knows, Volume 5, the beautiful conclusion to the Only the Ringer Knows saga from writer Satoru Kannagi and illustrator Hotaru Odagiri. Includes the side stories A Spring Break Secret and The Week Until the Ring Finger, which tells the beginning of Wataru and Yuichi’s relationship from Yuichi’s point of view. Finally volume 5! I have mixed feelings about this. Of course, I’m happy that we’ll be able to hear the answers now. Sad because well, it is the last volume. The last one where I’ll read about their love story. and ugh, Asaka. What catches my attention is the cover. The two of them holding hands, side by side and cherry blossoms around them. It implies their bond and equality. They have battled the toughest battles in the previous volumes and now they are looking for a brand new start – together. The cherry blossoms show a lot. I mention in my past posts how the books starting in volume 2 play out depending on seasons. The blossoms also mean a lot of things that are important for the characters. Got to love how everything starts and ends in Spring. In the previous books, each one is divided into two arcs. Usually, the first arc has the same title as the book’s title. In volume 5, while the title is The Finger Never Sleeps, the arc title is… have you guessed it? It’s Only the Ring Finger Knows. Kazuki and Wataru are not the only ones who have their resolution. Each and every one of them. And god, don’t get me started with Asaka. I feel like my tears are mostly because and for him. And I’m talking about gross sobbing OVER ASAKA. It really is hard when you like all characters who are in a love triangle. But I’m happy for him. He does not push himself to totally forget Wataru. He moves on while treasuring his past instead of forgetting them. Asaka is a graceful loser and for that, I love him a lot. If there is one thing that is lacking, it will be about Shohei’s conflict. It isn’t clear what is his stance on his brother’s relationship. I’d like to think that he is favoring them from the bottom of his heart or watching them on the sideline. And I am also waiting for a possible Shohei – Kazuki confrontation but nope, that does not happen. If you are unsatisfied with the lack of Kazuki in volume 4, you’ll most likely adore volume 5 for having not just more Kazuki but Kazuki POV scenes. It is fun to read Kazuki’s thoughts. He isn’t as forgiving as he appears to be. All that I can think of in the story is the word fate. Each and every one of them has an intertwined life. Like Wataru is destined to lose the ring just so Kazuki could pick it up, fall in love with him and followed by the string of events. It’s like any resistance to fate is futile (think: Kazuki giving up his love for Wataru before). Volume 5 has 2 extra stories included. The first one is A Spring Break Secret. It takes place during Kazuki’s passing in the university entrance exam and Wataru having a cold (it is mentioned in the first part of volume 4). The next extra is my favorite, The Week Until the Ring Finger. This one is set during the volume 1, when Kazuki is still harboring his unrequited love for Wataru. On the other hand, Wataru thinks his sempai’s behavior is because he is being hated. Of course, this is written in Kazuki’s POV too. Kannagi mentions in the afterword that she’ll release stand-alone stories about the couple after they start living together. The title is 君の指に届くまで. I also found SS from her Pixiv. It is in Japanese though.